A Representative from Orange County, Loretta Sanchez has beaten the odds before. 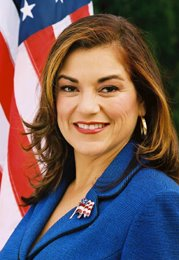 LOS ANGELES, CA -- Orange County Congresswoman Loretta Sanchez is about to upend California state politics as usual as she announces her candidacy for U.S. Senate, behind Barbara Boxer’s retirement. “I am here today to announce that I am a candidate for the United States Senate,” Sanchez told a group of journalists, supporters and friends. Surrounded by her family, Sanchez, 55, becomes the second Democrat to announce their candidacy to fill Boxer’s seat. Sanchez, best known for beating long-time Republican Congressman Bob Dornan in 1996 for his seat, will be facing fellow Democrat and State Attorney General Kamala Harris. Sanchez and other legislators have criticized Harris about her lack of experience in developing public policy and representing constituents at a different level. With nearly 20 years in Congress, Sanchez has established herself as one of California’s most powerful legislators. Although Harris has a stronghold in the San Francisco Bay Area, her presence in Central and Southern California has been limited and scared by accusations that her Deputies have lied under oath to obtain convictions, something she has denied being knowledgeable about. More recently, one of her staff was arrested for impersonating an officer. There are still two other potential Latino Democrats considering entering the U.S. Senate race (Congressman Xavier Becerra and Army Secretary Louis Caldera, Ret. ), however, political strategists believe Sanchez would be the most formidable candidate against Harris.